While most of America will be looking up on August 21 during the solar eclipse, America’s newest weather satellite, NOAA's GOES-16, will be looking down on the Earth, tracking the moon’s shadow across the United States with its highly sophisticated Advanced Baseline Imager. Rendition of NOAA's GOES-16 weather satellite. Image courtesy of NOAA. NOAA plans to issue images of the eclipse from GOES-16 and the agency's additional polar-orbiting and geostationary satellites as they become available. The satellite’s imager will provide three, high-resolution, color animations and still pictures of the eclipse. 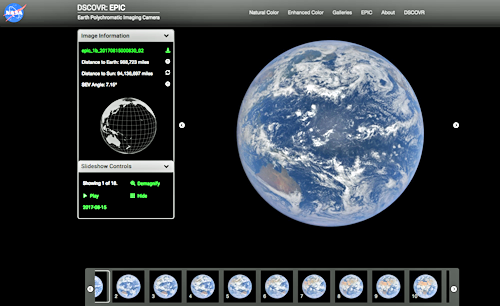 And flying on NOAA's DSCOVR satellite, is in orbit one million miles away between the Earth and sun, and past the moon, is the NASA EPIC camera. The high-powered EPIC will also take images and a movie of the moon’s shadow on Earth that likely will be available within one or two days following the eclipse. EPIC image is courtesy of NASA/NOAA.